Over several early mornings from late December 2017 and early January 2018, I watched sea otters going about their business in Monterey Bay. 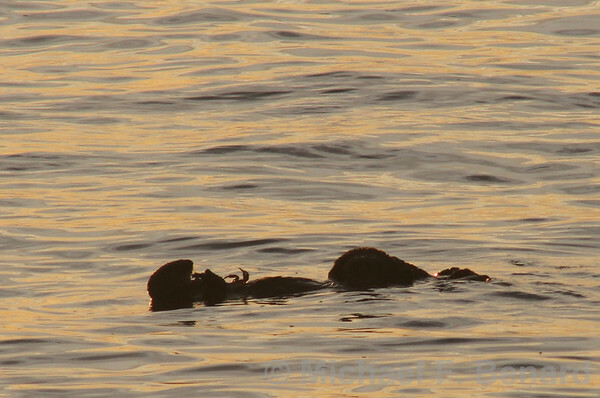 One of the fascinating things to see was the Sea Otters catching and eating their prey. The otters would dive under the water, often out of site for several minutes. Then they would pop back to the surface carrying their breakfast. From my perch on the cliffs, I was only able to make out a few of the prey the otters were eating. 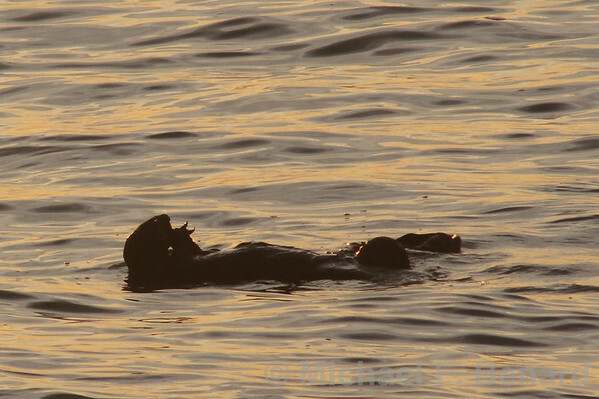 Here a sea otters floats on its back eating a crab. You can see another crab held on the otter’s belly, with its legs and claws up in the air. The fluffy ball near the otter’s feet is another otter that was swimming with it. With relatively easy-to-chew prey like crabs and starfish, the sea otters didn’t need any extra tools. However, that was not always the case. But some of the otters would come up with some hard prey item like a shellfish, and would smash it against a rock on their belly. My wife speculated that the otters might use the same rock over and over. 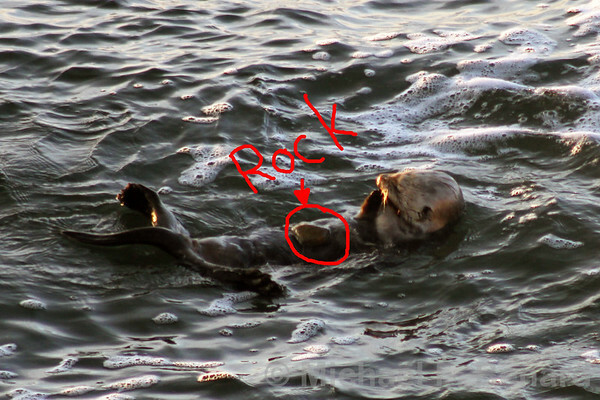 A little research on the Monterey Bay Aquarium’s website revealed that sea otters do indeed use the same rock. The sea otters actually have pouches of skin that they use to hang onto rocks and prey while diving. In this video of a sea otters smacking prey against a rock on its belly, you can actually hear the sound of the smacking above the sound of the surf! The otters must be delivering some powerful blows to break open the prey. This entry was posted in Citizen Science, Natural History, Photography, Video and tagged California, mammal, marine, monterey bay, sea otter. Bookmark the permalink.